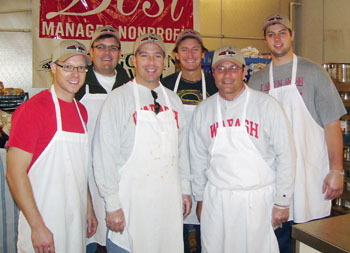 Six hearty Wallies rescued and repackaged over 1,000 pounds of food in Detroit at Forgotten Harvest, a food rescue operation in Detroit for Wabash Day. Michigan has lost one million jobs over the past decade, and no area has been harder hit than the Metro Detroit area, where 1 in 5 children now live in poverty. As one of Detroit's largest food rescue operations, Forgotten Harvest accepts surplus food from grocery chains, food manufacturers, as well as hotels and casinos, refrigerating, repacking, and distributing to food distribution operations throughout Michigan. Pasta and sauce, salmon, sausage, macaroni and cheese and the like were rescued from Joe Louis Arena, the Motor City Casino, and the Henry Ford.